Education is a huge part of our world, both past, and present. Many individuals have spent years researching and theorizing about how people learn. One thing that is certain, within the human race, not all individuals learn the same and not all theories work for all students. For me personally… I REALLY wish more people understood this! 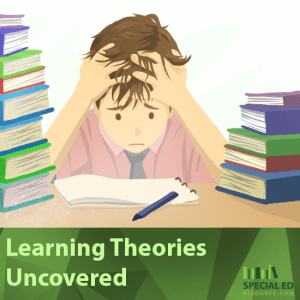 Let’s dive into Learning Theories in an attempt to shed some light on the different ways people learn and HOW to effectively teach in that way. It is essential to understand that some students need a combination of approaches and strategies, while others may work best in one type of classroom. Importantly, learning theories provide a framework for how individuals learn and how educators can best support students. Behaviorism refers to the changes in an individual’s behavior, that are measurable and observable. Using this theory within the classroom, educators can support students in behavioral change, until the behavior becomes a natural part of their routine. Please enter your details to download the free report. Learn how to navigate the public school system and obtain the best possible education for your child with a learning disability. The cognitivism Learning Theory takes the behavioral patterns to understand what is happening in the learner’s brain. The constructivism learning theory refers to the belief that students will construct knowledge for themselves, both in the classroom and during social interactions. Under the law, there are thirteen disability categories in which a child can be eligible in order to qualify for special education services. According to IDEA, once a child is found eligible for special education services through the evaluation process, the team must come together to create a child’s individualized education plan (IEP). Within this plan, the team will develop goals, services, and most importantly, the learning plan that will best support the child. Also through this process, all individuals involved with the child will provide ideas and agree upon a plan that best suits the student’s needs. Having a knowledge base for the different learning theories can provide a base of support for all stakeholders to make appropriate decisions. Connecting the theories to application is essential. When individuals that are a part of the IEP process are informed about different learning theories, the team members and stakeholders will be able to determine which learning theories or combination of learning theories will best support the students and their unique needs. The development of the individualized education plan is a crucial process that will ultimately aid in developing the instructional plan within the classroom to support the students and their needs. The learning theories, behaviorism, cognitivism, and constructivism can provide guidance on how educators can support each child. This support stretches to outside resources such as Special Education Tutoring as well. Additionally, having a knowledge base of these learning theories will allow educators to make appropriate decisions during these meetings. Finally, it is helpful to understand the learning theories and use a combination of the theories to best support students. While one theory may work for one student, it may not work for another. Have you found one learning theory that works best for you and your child? Please comment below! This entry was posted on Tuesday, April 2nd, 2019 at 3:52 pm and is filed under Special Education Tips and tagged as Laura Young, School Work Hacks. You can follow any responses to this entry through the RSS 2.0 feed. Outstanding article and overview, very thorough. Thank you! Learning Theories are important to understand because EVERYONE learns differently. If someone is struggling to understand the content their being taught, switching to a different learning theory may solve all issues! There are tons of Special Education Resources available to assist in this process.